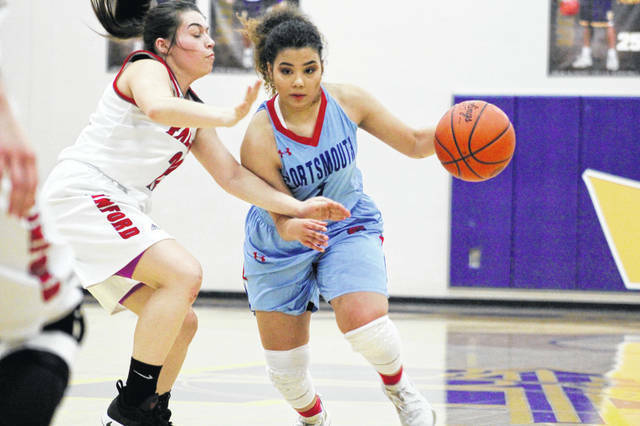 Portsmouth’s Jasmine Eley led all scorers with 18 points in Monday’s 50-36 loss to Minford. Minford’s Livi Shonkwiler drives past a defender during Monday’s 50-36 win over Portsmouth in a Division III sectional semifinal. LUCASVILLE — When Minford coach Shane Davis walked up to McKenzie Watters Monday evening, his message was simple. Watters simply said, “OK,” and proceeded to go out and lead the team in scoring off the bench. That play, alongside a balanced effort from her teammates, allowed the Falcons (16-6) to hand Portsmouth a 50-36 loss in a Division III sectional semifinal at Valley High School. Watters wasn’t the only Falcon who made a significant difference in Monday’s victory. Hannah Tolle also fits that description. But making a difference is what Tolle’s been doing for quite some time now. In the win, Tolle tallied nine points, seven rebounds and four assists. But most importantly, she made good decisions and took care of the basketball. When she’s playing well, so is Minford. Minford got on the board first with 7:06 left in the first quarter when Ashley Blankenship scored. But the Trojans (7-13), who came ready to play, got back-to-back baskets from Ashanti Richardson and Jasmine Eley, taking a 4-2 lead at the 5:50 mark. The Falcons then went on an 8-0 run, going up 10-4, before Portsmouth’s Nia Trinidad hit a 3 to make it 10-7 after one. In the second, Portsmouth continued to land punches. When Eley hit one of her four 3’s with 6:20 to go, the Trojans had a 12-11 lead. Hannah Hughes followed with a 3 of her own, making it 15-11 and giving her team its largest lead of the night. Down 15-11, The Falcons ripped off a 12-0 run behind Tolle and Watters. Tolle hit two 3’s, coming at the 4:02 and 1:29 marks, while Watters made a difference on the glass. By halftime, the Falcons had a 23-16 edge. Eley continued to fire from deep in the second half but the Falcons’ depth was too much to overcome. Minford took leads of 28-18, 34-21, 40-27 and 45-32 throughout the second half en route to the win. That stat sheet was a balanced one for Minford. Watters led the Falcons with 13 points and five rebounds while Blankenship added 12 points and six boards. Tolle pieced together her complete effort, tallying nine points, seven rebounds and four assists, Slusher had seven points, Shonkwiler had five points and a team-high five assists, and Puckett had four points and a team-high eight rebounds. Eley led all scorers with 18 points, including four 3-point field goals, alongside four assists, Hughes had eight points and six rebounds, and Richardson scored six points. 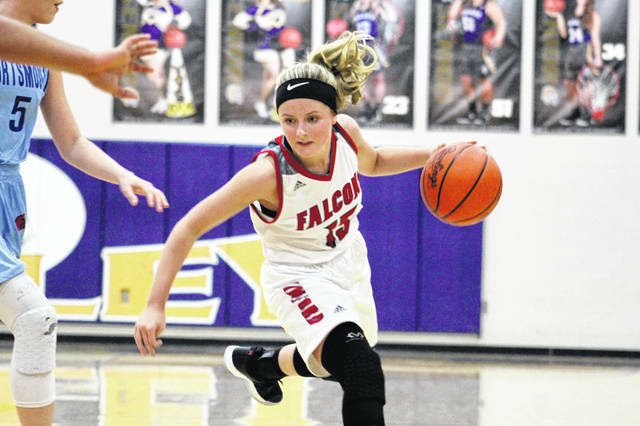 While Portsmouth’s season comes to its end, Minford advances to a Division III sectional final where the Falcons are slated to face North Adams at 2:45 p.m., Saturday at Valley. Portsmouth: 14-39 FG, 2-8 FT, 6-17 3pt. (Eley 4), 17 rebounds (Hughes 6), 18 turnovers, 5 assists (Eley 4). Scoring: Eley 18, Hughes 8, Richardson 6, Trinidad 3, Rickett 1. Minford: 22-56 FG, 2-3 FT, 4-12 3pt. (Tolle 3), 34 rebounds (Puckett 8), 15 turnovers, 14 assists (Shonkwiler 5). Scoring: Watters 13, Blankenship 12, Tolle 9, Slusher 7, Shonkwiler 5, Puckett 4.